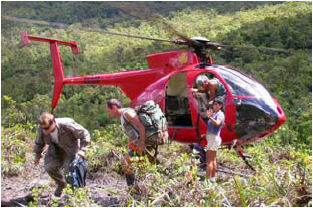 Securing forest bird habitat was the con­ser­va­tion goal of our first Hawaiian cam­paign (1981-83). Conservationgoals for ecoregional planning require explicit identification of landsand waters to be placed under effective conservation management, so thatrepresentative biodiversity (in the form of conservation targets) issecured. Goals may include area (e.g., at least 100,000 acres ofprotected montane wet system), occurrences (e.g., four occurrences ofviable contunous perennial streams per high island), or percent (e.g.,at least 75% of all waterbird concentrations). Explicitgoals were not developed in the 1998 ecoregional plan, and theportfolio consisted of all native-dominated areas on all the mainislands. Goalsetting and portfolio development for ERA II, however, followedguidelines andprinciples outlined in Geography of Hope, augmented by more recent guidance available from TNC ecoregional working groups. StratificationUnits aregeographical subsets of an ecoregion that aid in ensuring maximumecological and evolutionary variability of protectedbiodiversity. There arestrong distribution patterns of biologicaldiversity across the Hawaiian archipelago. Theolder islands ofO‘ahu and Kaua‘i are biologically distinct, and the islands comprising "Maui Nui"(Maui, Moloka‘i, Lāna‘i, andKaho‘olawe) are biologically similar and distinct from the other islands. Theyoungest island, Hawai‘i, is also justifiably a separate stratification unit because ofits great size (larger than all the other islands combined) and its geologicalyouth (Wagner & Funk 1995). The four resulting stratification units (see Figure 1 below) werethe basis for redundancy across the ecoregion. 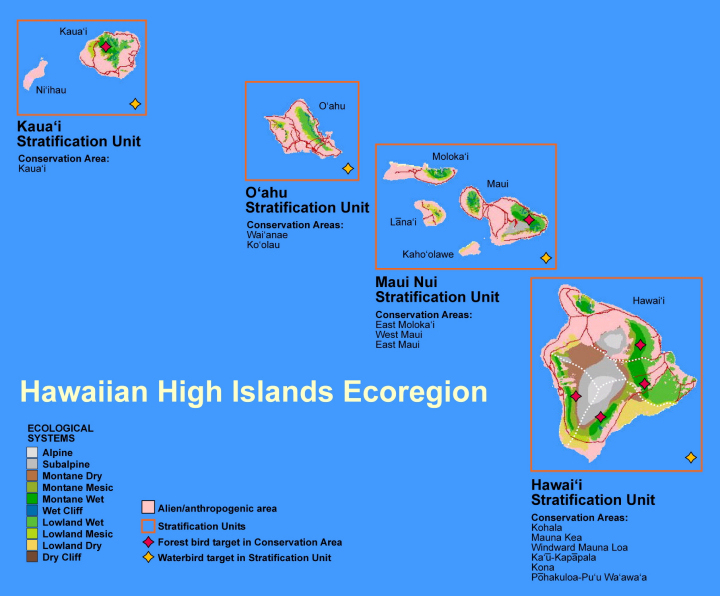 For more details on the Stratification Units of the Hawaiian High Islands Ecoregion, click here. · Include all occurrences with viability ranked good or very good.The limited geographic area of the Hawaiian Islands, and the low numberof remaining viable ecological systems requires, in our assessment, thegreatest possible inclusion of viable conservation targets. · Add fair ranked occurrences to ensure at least two occurrencesof each ecologicalsystem per stratification unit (if extant). Diversity ofecological systems is not adequately covered by inclusion of those ofgood or better rank alone. · Select four high ranked/quality occurrences of continuous perennial streams oneach high islandwhere streams occur, stratifying by conservation area as appropriate. This results in 20 selected streams in theecoregion, or more than 10% of the total remaining occurrences. · Select all forest bird concentration occurrences ranked good or very good. 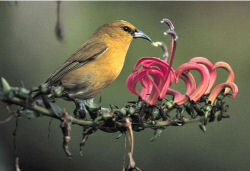 Given the history of decline of forest bird species in Hawai‘i, our assessment concludes that all remaining viable occurrences should receive protection. · No rare plant concentration areas were selected, because all were of poor viability. · Select all waterbird concentration occurrences recommended by the USFWS recovery planas neededfor recovery. Their recovery assessment is appropriate goal-setting for both scientific and strategicreasons. Applyingthe goals described above resulted in a terrestrial target ecoregional portfolio of 16 conservationareas,including four broadly defined areas that encompass waterbirdconcentrations (see Summary Table below). Brief summary descriptions for theconservation areas are provided in the Appendices. Figure1: Four Stratification Units (SU) were established to account forecological and evolutionary variability across the Hawaiianarchipelago.Redundant examples of all conservation targets across the four SUshelpsensure that island and regional biodiversity is captured in theecoregional portfolio of conservation areas. The table at right depicts the end result of the goal-setting processas described above. Redundant representation for ecological systems,stream communities, and viable species concentrations is seen for eachof the four stratification units. Each black dot represents aconservation target added to the ecoregional portfolio. 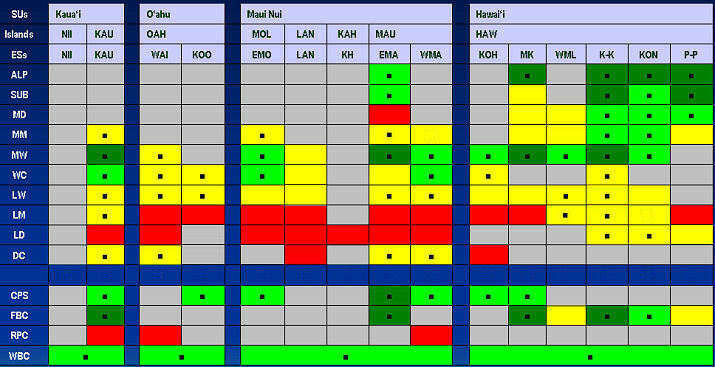 Key to abbreviations: SU =Stratification Unit; ES = Ecological System, NII = Ni‘ihau, KAU =Kaua‘i, OAH = O‘ahu, MOL = Moloka‘i, LAN = Lāna‘i, KAH = Kaho‘olawe,MAU = Maui, HAW = Hawai‘i; Conservation Areas: NII = Ni‘ihau, KAU =Kaua‘i, WAI = Wai‘anae, KOO = Ko‘olau, EMO = East Moloka‘i, LAN = Lāna‘i, KAH = Kaho‘olawe, EMA = East Maui, WMA = West Maui, KOH = Kohala, MK = Mauna Kea, WML = Windward Mauna Loa, K-K = Ka‘ū - Kapāpala, KON = Kona, P-P = Pōhakuloa- Pu‘u Wa‘awa‘a; Targets: ALP = Alpine System, SUB =Subalpine System, MD = Montane Dry System, MM = Montane Mesic System,MW = Montane Wet System, WC = Wet Cliff System, LW = Lowland WetSystem, LM = Lowland Mesic system, LD = Lowland Dry System, DC = DryCliff System; CPS = Hawaiian Continuous Perennial Stream Community,FBC = Forest Bird Concentration, RPC = Rare Plant Concentration,WBC = Waterbird Concentration. Black dots indicate target selected for portfolio. Bringing active management to priority ecological systems isthe primary goal. 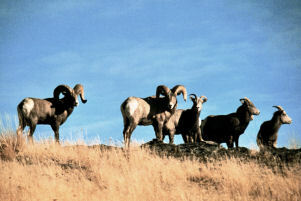 Alien species, such as feral ungulates, are a prevailing threat to native conservation targetsin all conservation areas in Hawai‘i. Other combinations that yield an overall rank of good may also beconsidered, with one viability/integrity condition factor falling to fair, but balanced by others of good or very good rank. Applying thisminimum goal to our portfolio means active management of threats thatraise overall rank from fair to good for all ecological systems of lessthan good overall rank. For conservation areas with large area occurrences of ecologicalsystems (e.g., Hawai‘i Island, Maui), there might be room toidentify subsets of the total area (but exceeding 18,750 acres minimumsize) within which to actively reduce threats (and improve condition)and ensure improved landscape context. What these goals mean for the ecological system occurrences for eachStratification Unit is that some systems with overall good or very goodrank can be maintained at that level, while any with fair rank shouldbe improved via active management toward a rank of good. Over half ofthe ecological system targets in the portfolio require this kind of improvement.These typically lie at lower elevations. The next column offers, in asummary table, the specific recommendations for achieving the desiredranks. When we first considered adding coastal conservation targets to theinitial terrestrial ecoregional assessment, we asked explicitly if thestrategy of establishing stratification units involving multipleislands (e.g., Maui Nui) was valid for coastal biodiversity. There is far less distinctiveness of island coastalvegetation, lower endemism, and fewer overall species; therefore lessjustification for that level of stratification. However, generalrepresentationacross the main archipelago is proposed, including occurrences on eachof the main islands and associated islets. For coastal vegetation,within-island stratification via four major moisture settings (verydry, dry, mesic, and wet) captures the variation of coastal speciesdistribution. Anchialine Pools - The majority of anchialine pool occurrences are on the island of Hawai`i. To help stratify geographically, the goal includes at least ten viable pool occurrences per DAR aquifer sector. Seabird Nesting Concentrations - Recognizing that seabirds once maintained huge nesting concentrations on the main islands, the goal includes at least one viable occurrence per main island, and all viable occurrences on islets. Native Coastal Vegetation- Recognizing that native coastal communities vary in composition andstructure according to moisture setting, our goals include 20% of the shoreline for each main island, with at least two viable occurrences per moisture regime (very dry, dry, mesic, wet).